One of the most consistent Injustice: Gods Among Us combo posters is back to work. Watch TrU3Ta1ent's latest lab efforts inside. TrU3Ta1ent has delivered another Injustice: Gods Among Us bread and butter (BnB) combo tutorial. 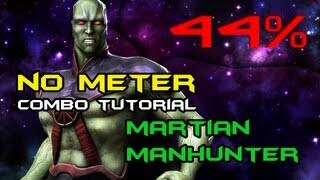 He once again took Martian Manhunter to the lab to demonstrate a 44-percent meterless combo.